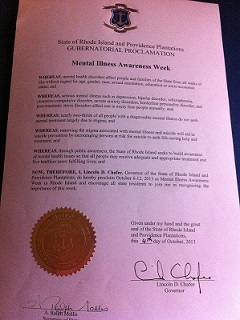 I just want to say thank you to the following governors for proclaiming the second week of October to be Mental Illness Awareness Week in their state. For more background on why they did this, click here. 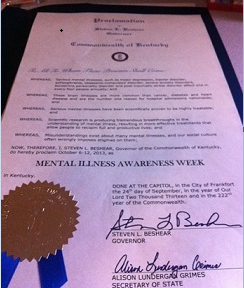 I would also like to thank the Governor of Maryland for his correspondence and the Governor of North Carolina for writing a speech for an event we had in Winston Salem, NC as part of Mental Illness Awareness Week on October 12, 2013. 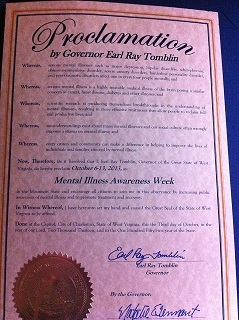 Having several organizations get together to raise awareness can be done. 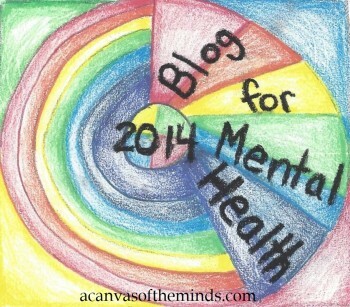 There are weeks, days, and months set aside for various different mental illnesses and different causes that have to do with mental health. However, because there are so many different ones, the voices of those who have a mental illness and/or their supporters get lost. 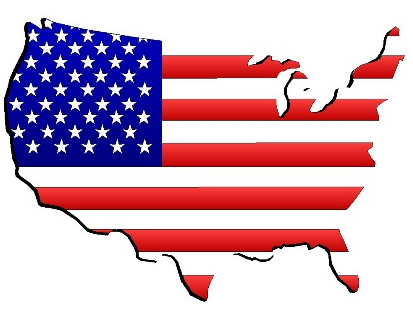 If there is one day that is chosen to observe Mental Illness and Mental Health and it is shared nationally, hopefully more people would take notice of the changes that need to be made and how mental illness affects them. 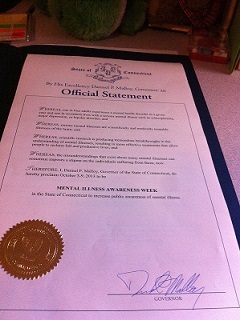 This entry was posted in Uncategorized and tagged #MentalHealthMatters, connecticut, dannel p malloy, earl ray tomblin, governors, kentucky, lincoln d chaffee, mental health conference, mental health matters, mental illness, mental illness awareness week, MIAW, montana, President Obama, raise awareness of mental illness, rhode island, stephen l beshear, stigma. Bookmark the permalink.